You can sync passwords that you've saved in Yandex Browser on your computers, smartphones and tablets. During the syncing process, an encrypted copy of your password repository gets sent to the Yandex server and then passed on to your other synced devices. At the same time, passwords from your other devices are added to the vault on your current computer. If your computer fails, you can restore passwords from the server. In the Syncing section, click Show settings. 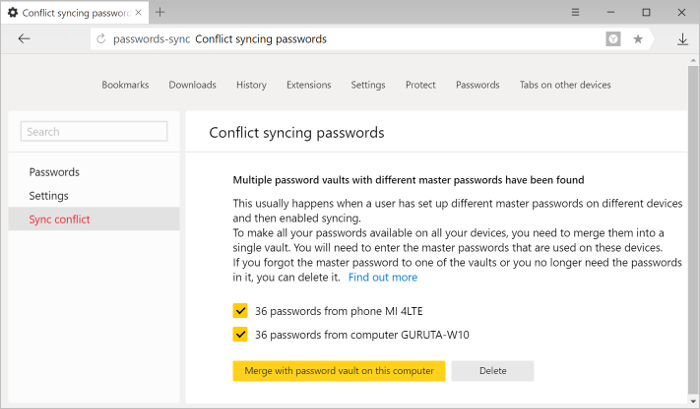 If you created different master passwords on your smartphones, tablets or computers, there may be a conflict during syncing. For example, let's say you entered one master password on your smartphone and another on your computer, and then synced your smartphone with your computer. In these cases, the browser does not know which master password must be used to encrypt the merged vault. Click . If you don't do this right away, the settings icon will go back to its original appearance after some time. Then click → Password manager. Enter a master password for the computer you're using. In the tab that opens, click Syncing conflict. The next steps you take will depend on whether you remember the master password you saved on your other device. Click Merge with password vault on this device. Enter the master password for your other device. That way the browser will re-encrypt passwords from your other devices using the master password for your current computer. The master password for your other device will become invalid. Passwords from your current computer will be added to your merged password vault. In this case, you can delete your passwords from your other device. Just click Delete. Passwords encrypted using the master password you forgot will be deleted from all your synced devices. Passwords from your current computer will be added to your merged password vault. The vault will be encrypted using your master password from the current computer. You can also choose not to resolve conflicts. In this case, the passwords will not be synced (the history, bookmarks and other data will be synced as before). Note. If you created a backup encryption key on another device, try resetting the master password on it. Enter the master password for the computer you're using as your new master password. Mark the vaults that you want to join with your current one. That way the browser will re-encrypt passwords from your other devices using the master password for your current computer. Your master passwords on other devices will be invalidated. 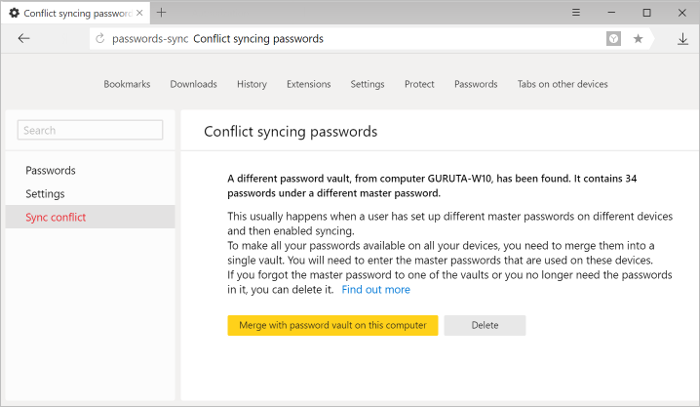 Passwords from your current computer will be added to your merged password vault. In this case, you can only delete your passwords from your other devices. Just mark the vault whose master password you don't remember and click Delete. Passwords encrypted using the master password you forgot will be deleted from all your synced devices. Passwords from your current computer will be added to your merged password vault. The vault will be encrypted using your master password from the current computer. Enter your old password in the sync form. Make sure that the browser has all the bookmarks, extensions, and settings that you want to save. Click delete under Syncing. Your profile data will be deleted on the server. Enable syncing. Data will be sent from your browser to the server.